Featured Image: Martyr Biswajit Ghorai being paid last respect before cremation at Sagar in South 24-Parganas on Tuesday. 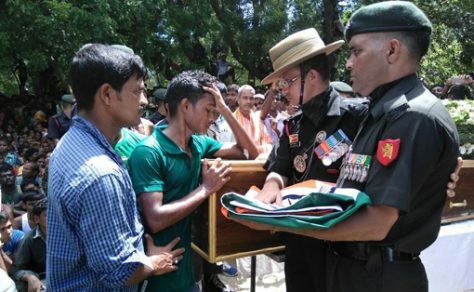 Howrah / Diamond Harbour, 20 September: WEST Bengal government has announced an aid of Rs 2 lakh each for the family of the two Army jawans from the state who have been killed in the terror strike at Uri Army base in Jammu & Kashmir. This apart, the government has offered to employ one family member from each of the two bereaved family in the state Home Guard. The announcement came on a day Gangadhar Dalui of Howrah was cremated with full military honour at his native village Jamuna Balia in Jagatbalalvpur, and Biswajit Ghorai was cremated at his village Sagar in South 24-Parganas. Uri Martyr Biswajit Ghorai’s brother breaks down in front of his coffin at Sagar in South 24-Parganas on Tuesday. Aged around 25-years, both of them were soldiers attacked to the 6 Bihar Regiment of the Army and got killed in the terror attack at Uri Army base on 18 September. Their mortal remains were flown in to Kolkata airport by an Air Force aircraft last night and then taken to the Army’s Command Hospital at Alipore in south Kolkata. While Dalui’s body was then taken to his home at Jamuna Balia by road in the wee hours today; Ghorai’s remains was flown in to his native village Sagar in an Air Force helicopter today morning. 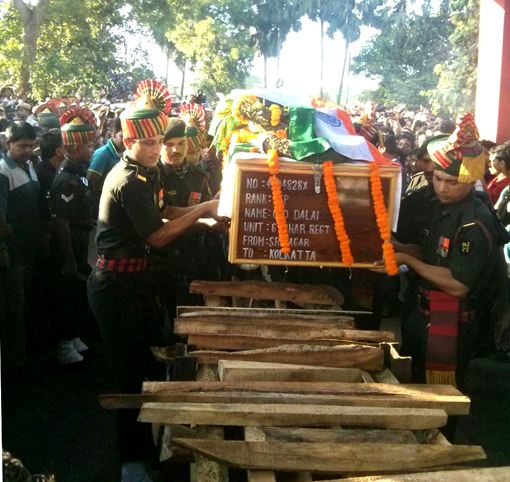 Dalui was cremated with full military honours early in the morning at Balia in presence of state cooperation minister Arup Roy, irrigation minister Rajib Banerjee, and senior Army-police officials. Almost entire village of the young martyr turned up at the cremation to pay their last tribute as he was being consumed to flames amid gun salute by Army soldiers. Uri Martyr Gangadhar Dalui being placed on the funeral pyre at Balia village in Howrah on Tuesday morning. Ghorai too was cremated around noon in a similar fashion at his village Sagar. State fire minister Sovan Chatterjee, Sunderbans affairs minister Manturam Pakhira, local MLA Bankim Hazra, and senior Army-police officials were present to pay their last respect. A large number of people from Sagar and the adjacent villages turned up to be part of the tragic occasion. Later in the day, Chief Minister Mamata Banerjee told reporters at state secretariat Nabanna in Howrah that the state government would provide an ex-gratia of Rs 2 lakh each to the bereaved families. Also, the government will give employment to one member from each of the two families in the state Home Guard, she said.